Signs & More banners are hemmed and fitted with grommets (those little metal hole things). These grommets are the keys to hanging your banner. 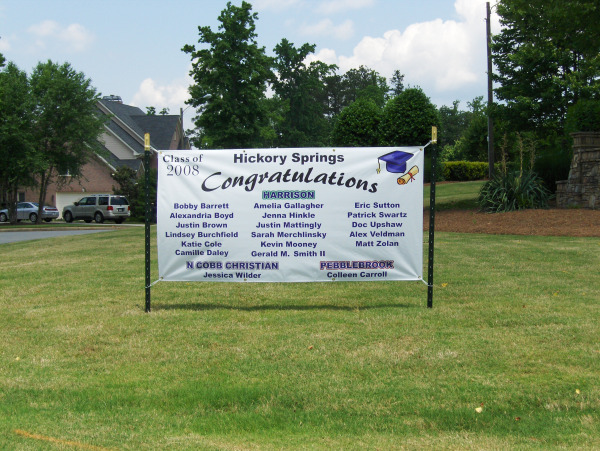 Signs & More can provide posts on which to hang your banner OR you can purchase your own at any home improvement store. The steel posts with the ridges/notches (WITHOUT holes) provide the strongest anchors for hanging a banner. You will need some long zip ties and short zip ties too. 1. Lay banner out on the ground. 2. 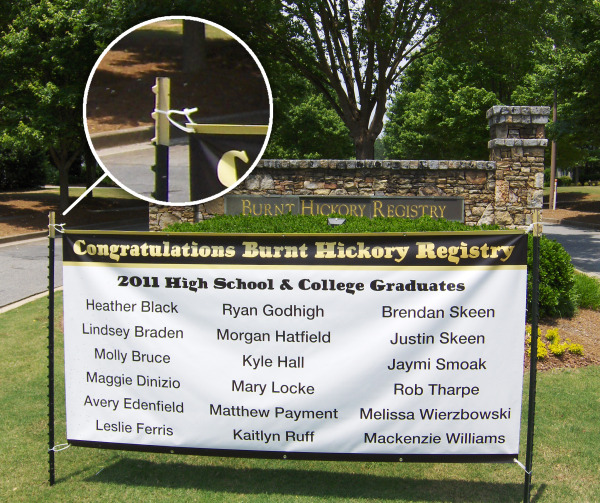 Place posts approximately 6 – 8 inches away from each side of the banner. Best to use a fence post driver to make easy work of getting posts into the ground. MAKE SURE FLANGES ARE PERPENDICULAR TO BANNER. 3. Use 4 long zip ties (banner) and 4 short zip ties (post). 4. Attach one short zip tie around the top of each post in between the top 2 ridges/notches. 5. Thread a long zip tie through the top right and left grommets of the banner. 6. Then thread the zip ties through the zip ties in #4. Do one side and then the other. NOTE: DO NOT TIGHTEN BANNER ZIP TIES UNTIL ALL 4 ATTACHED. 7. Repeat steps 4 – 7 on the bottom right and left of each banner. 8. Pull zip ties tight so the banner is displayed without wrinkles. Your banner should remain stable this way for weeks or months. If it loosens, just further tighten the zip ties.